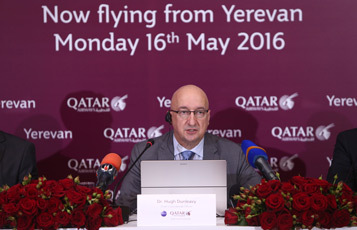 Qatar Airways today added Armenia to its global route map, and commenced four times weekly service between Doha and Yerevan, connecting the city and country with more than 150 destinations worldwide. The inaugural flight touched down in the early hours and was greeted by a traditional water salute, Qatar Airways’ Chief Commercial Officer Dr. Hugh Dunleavy, who travelled on board the inaugural flight with Armenia’s Ambassador to Qatar, His Excellency Mr. Gegham Gharibjanian were greeted at the arrival gate by Yerevan’s Zvartnots International Airport, Deputy General Manager, Mr. Andranik Shkhyan. Yerevan is the cultural, political and industrial capital of Armenia and offers visiting business and leisure passengers a rich and diverse experience. With a city backdrop of the snow-capped Caucasus mountain range and situated on the Hrazdan River, Yerevan is one of the world’s oldest cities, and is sure to attract visitors from around the world on the new Qatar Airways service which places the city within easy reach. The airline will fly the Airbus A320 direct to and from Yerevan on the four-weekly schedule, featuring a two-class cabin configuration comprising of 12 seats in Business Class and 132 Economy Class seats. 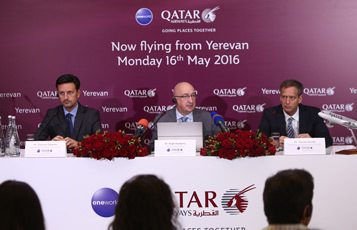 The new service to Yerevan will also add a total of 48 tonnes of belly-hold capacity weekly on the A320 aircraft, delivering freight between Yerevan and Doha and onwards to Qatar Airways Cargo’s global network. Passengers flying from Yerevan and onwards to any of more than 150 destinations on Qatar Airways will enjoy a quick and convenient transfer at Hamad International Airport, the newest airport hub in the world. Offering more than 100 retail and dining options and unique services such as a swimming pool, hotel and spa, designed exclusively for those in transit, the airport is sure to further enhance the passengers’ overall travel experience. Qatar Airways, the national carrier of the State of Qatar, is one of the fastest growing airlines operating one of the youngest fleets in the world. Now in its 19th year of operations, Qatar Airways has a modern fleet of 184 aircraft flying to more than 150 key business and leisure destinations across six continents.